Head Start students at the William Patrick Day center sang, danced and watched in amazement as a performer from the Djapo Cultural Arts Institute in Cleveland gave a special show from the musical Mufaro’s Beautiful Daughters. The story is about two beautiful daughters who react in different ways to the king’s search for a wife – one is aggressive and selfish, the other kind and dignified. The Council for Economic Opportunities partners with Playhouse Square to bring the magic of theater to Head Start children. 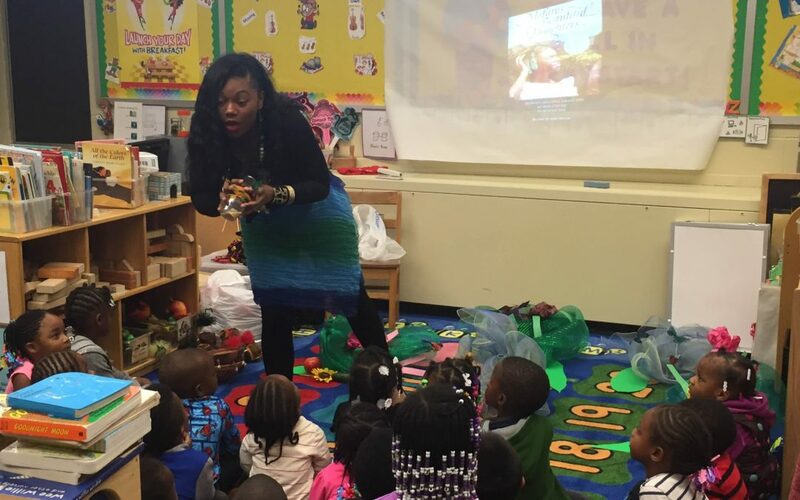 Head Start students take field trips to see live shows and a few lucky classrooms will get to see Mufaro’s Beautiful Daughters this month. As Miss Taylor from Djapo acted out special scenes from the story, students were on the edge of their seats. She sang with them and they all played instruments made out of cups and beans. The children and teachers were captivated by the performance and couldn’t wait to see how the story ended. They enthusiastically belted out the new song they learned and gave Miss Taylor huge applause at the end of the story. We love offering our students the opportunity to experience music, culture and the arts right in their Head Start classroom. Representatives from the Djapo Cultural Arts Institute will be performing at Head Start centers including Bellaire, Buckeye, Green Road, Louis Stokes, Puritas and Willard over the next week. The Council’s Head Start children and families experience enriched programming through partnerships with organizations including Beck Center for the Arts, Greater Cleveland Aquarium, Great Lakes Science Center, Lake Metroparks Farm Park, the Music Settlement, Playhouse Square, Rainy Institute, Rock and Roll Hall of Fame and Shaker Lakes to name a few. We wish to offer a very special thank you to our arts and cultural partners for all you do to enhance the lives of children in our community.